Let’s say you have a bag of wheat and a chessboard. Start with one grain of wheat in the first board, and double it with each subsequent square. By the 64th square, you’d have 18 quintillion grains! This is a power that you can harness to enhance your business growth. The definition of exponential growth is the rate of change over a given number of equal time intervals. To speak plainly, when business continues to double over multiple time intervals, each 100% increase is added to the original value, which results in compounding growth. Keep in mind that doubling your growth each year is not necessarily exponential growth. It takes many years of this type of expansion to reach exponential growth. One of the largest factors of exponential growth is called the “viral coefficient,” another buzzword you may have heard of before. The viral coefficient, or “going viral,” is the massive effect that word-of-mouth marketing can have. For example, if one customer is satisfied with your product enough to recommend it to five of their friends, and then they recommend it to five of their friends, your business will grow exponentially. After going viral, a product or service can be taken over by network effect. The product becomes more valuable as more people use it. Instagram is a good example of the network effect. The most successful brands of our generation are a result of exponential growth. Take, for example, the rise of Snapchat, Airbnb, Lyft, and Bird Scooters. Below are some specific examples of companies who have fully achieved exponential growth. You may not have heard of this one if you live outside of China, but this is one of the most prominent examples of exponential growth. DiDi is China’s rideshare app of preference, far outshining Uber and Lyft usage. Though DiDi was founded three years after Uber, it has 475 million more active users than Uber! DiDi also boasts 21 million drivers vs Uber’s 3 million, and averages 30 million riders per day, doubling Uber’s 15 million each day. The exponential growth of DiDi was enormous to allow it to overtake Uber’s 3-year head start! One of the most well-known examples of exponential growth has to be the meteoric rise of Facebook. As of 2004, Facebook had just 1 million monthly active users, which skyrocketed to 2.32 billion users by the end of 2018. That calculates out to a 231,900% increase in just 14 years! The revenue stats are even more impressive. In 2004, Facebook made under half a million dollars in yearly revenue. However, by 2018 Facebook was bringing in 5.5 billion dollars, a 13,753,150% increase! 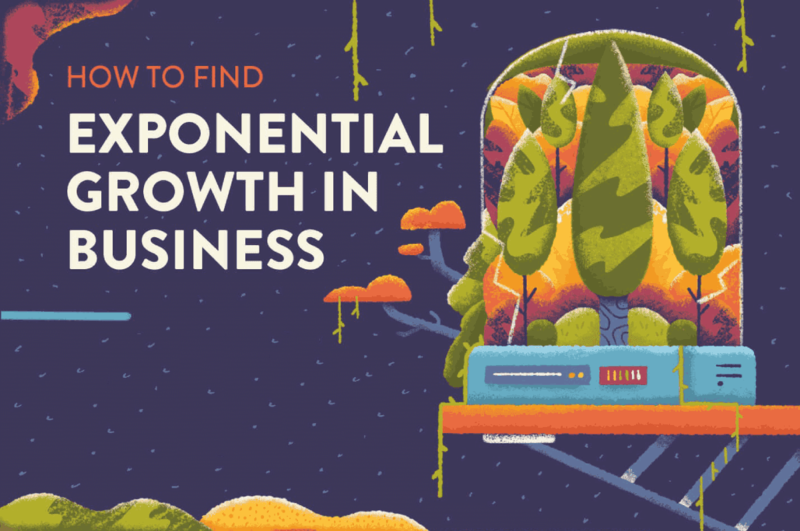 How Can Your Company Achieve Exponential Growth? So you don’t run Uber or Facebook, what can your company do to emulate the successes of these companies? Though it won’t be easy, below are some ways your company can produce products and services that are 10x, and hopefully achieve exponential growth in the process. No one wants to work hard in order to understand your product or service. If your product is too complicated to use, you’re going to risk alienating a large portion of your audience. Losing any portions of your audience is not going to help you on your way to exponential growth! In order to avoid this, think about doing what some are calling the “Grandma Test.” Basically, would your own grandmother be able to figure out your product? It’s a great way to test how user-friendly your product is. If you wouldn’t recommend it for your own grandma, then chances are others wouldn’t either and the word-of-mouth referrals would stop there. Not only should your product be simple to use, but it should also be pleasant and memorable. UX can often be overlooked as a company growth factor, but it’s actually really important for maintaining the viral coefficient. Implementing a referral or share incentive is a great way to ensure word-of-mouth communication. It helps users remember to tell their friends and family about the great new product they discovered and brings new users in who will then be tempted to share the product with their own social circles. If offering referral bonuses feels a little too salesy, social sharing can be a good option since it has a more organic feel. You should offer users something appealing that they can easily use to share with their followers, such as level scores and a daily login tracker. Does your business have the infrastructure and resources needed to succeed exponentially? You need to make sure that you don’t outgrow your capacities too quickly, as this is the downfall of many a startup. If demand for your product increases, will you be able to fulfill that demand? For example, restaurants are not built to scale exponentially. A server can only take care of so many tables before he or she is overwhelmed, and must either turn customers away or hire additional help in order to deal with the increased demand. This is a linear growth model, and would not be able to scale exponentially. An example of a company that does this well is, again, Uber. During rush hours and inclement weather, there is more of a demand for drivers. As Uber can’t magically make more drivers appear to meet this demand, they institute surge pricing to bring profits up and ensure that some potential riders will be turned away. Take a look at the graphic from CleverTap below to learn more.